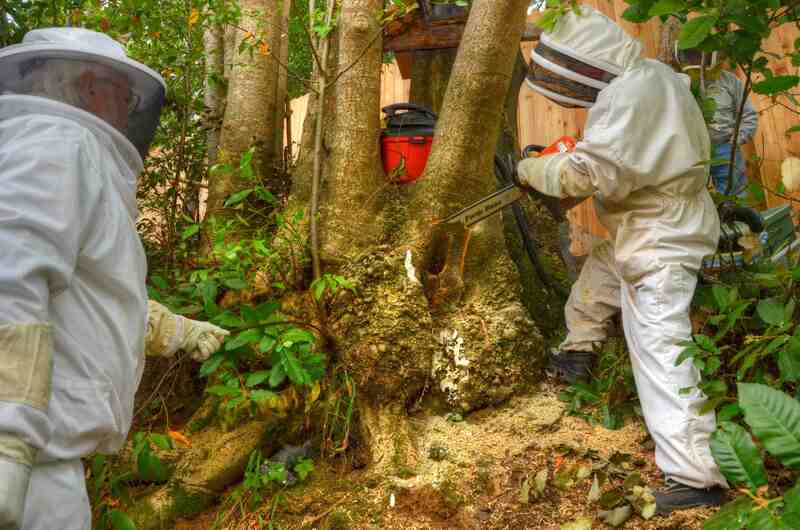 When Dan discovered a tree full of bees on his property, he wanted to save the bees and the tree so he asked Del for help. 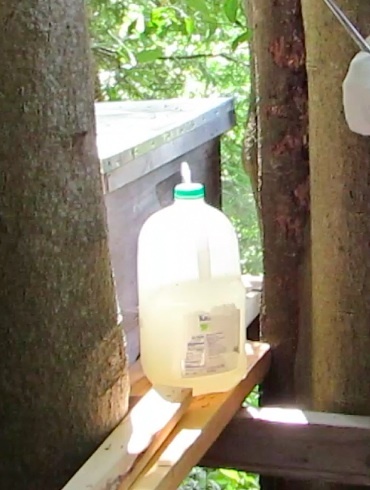 This bottle of sugar water is accessible from outside the hive so Del can add more water without disturbing the bees. 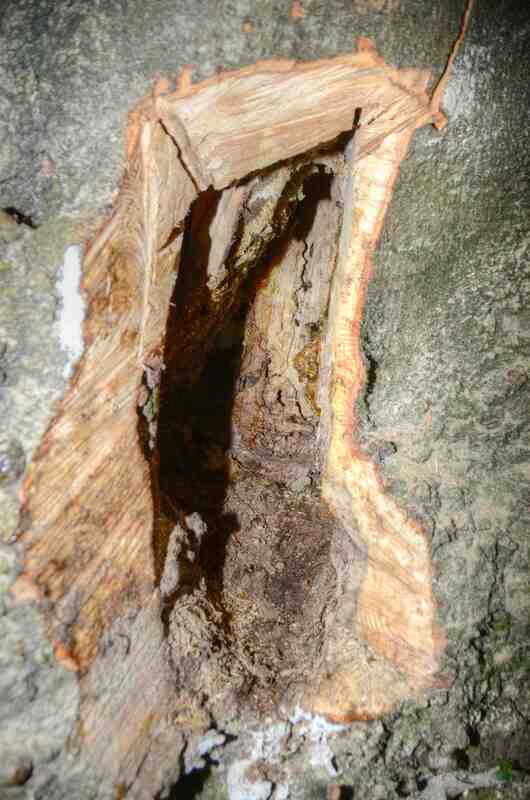 The screen is fastened to the tree so the bees have only one exit and that is through the narrow hole in the end. 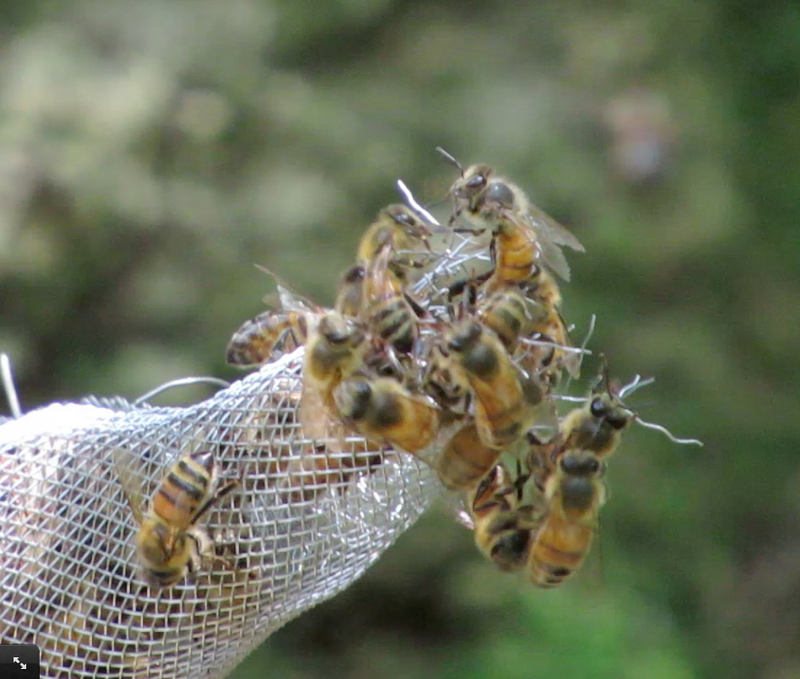 The hole has wires sticking outward so bees can only travel one direction…out. 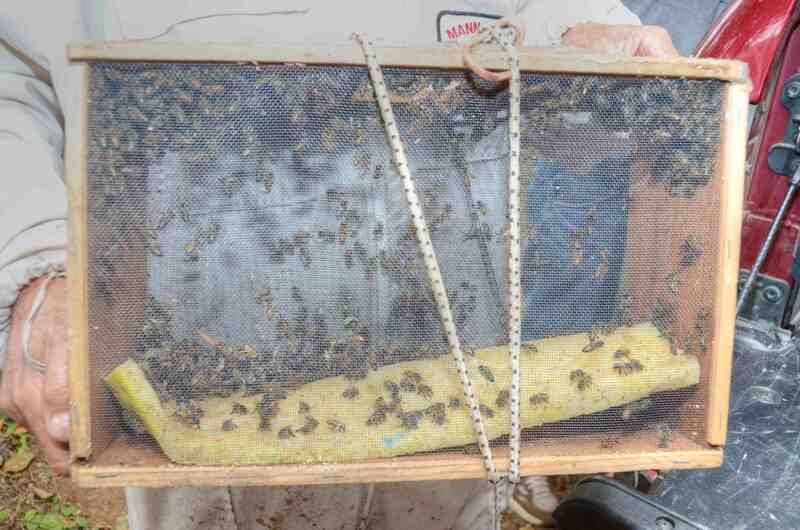 The idea is the bees will come back to the screen, discover they can’t go back in and use the hive box above. 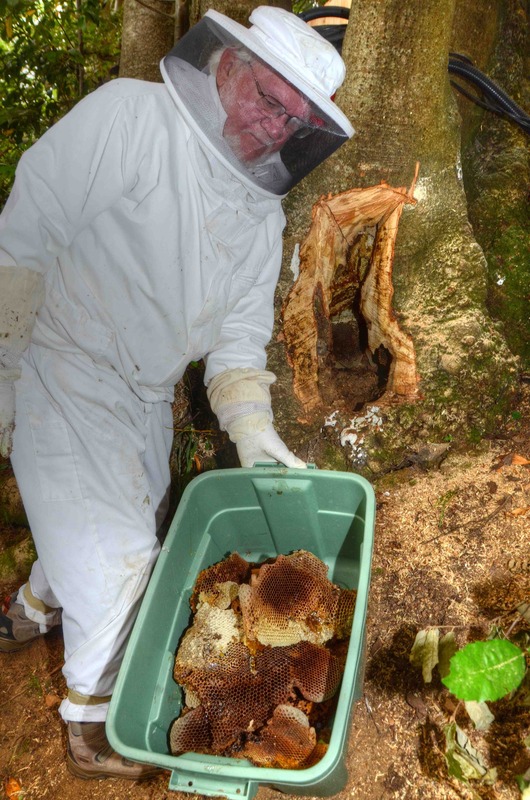 If all bees smell the same, they will be able to enter the hive box unchallenged. When Del sprays peppermint water on the bees, it not only calms them, but makes them smell the same as the bees in the hive. The internal temperature on the fourth day is 92 deg F. (33 C). 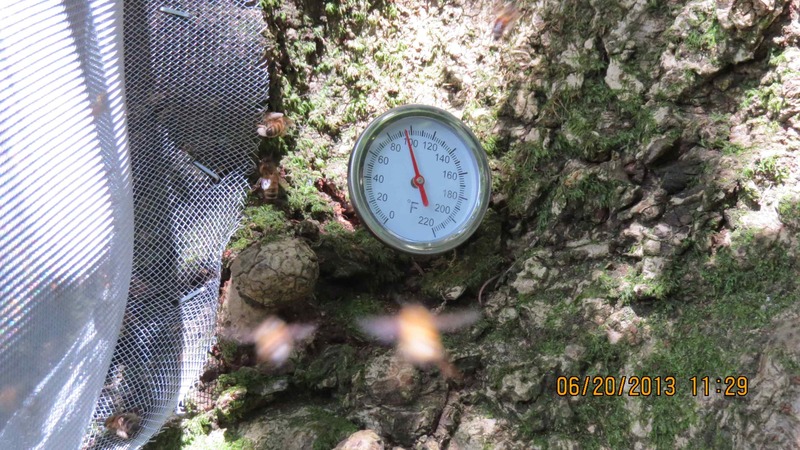 As more and more bees move out the temperature will drop. Del and Jim, on level ground after checking on status of hive. 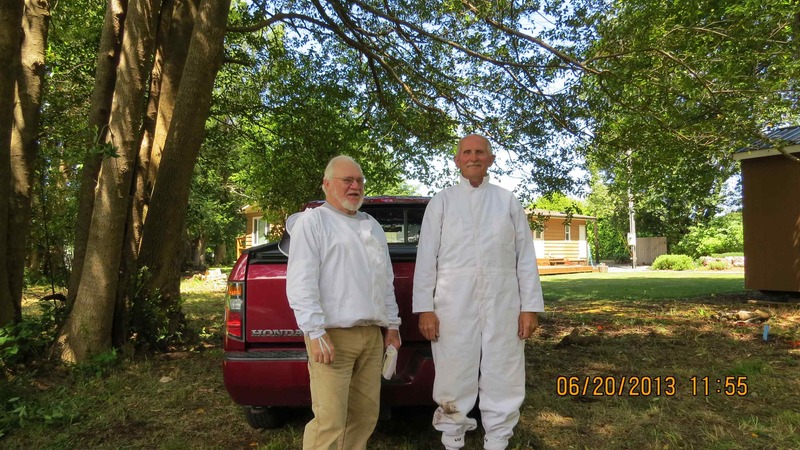 Jim collaborated with Del to come up with a plan on how best to remove the bees with the least number of casulties, monitored the internal temperature of hive on an almost daily schedule and kept the screen exit open when the drones tended to plug it up. 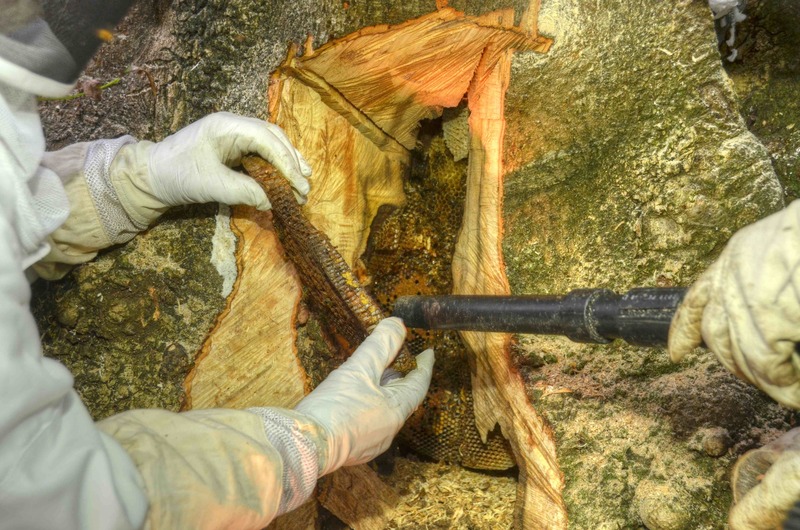 As the internal temperature of the tree dropped, the hive above grew. Five frames grew to 10 frames, and soon they added another 10 frame deep. After about 6 weeks, when the thermometer had plummeted to 78 deg. F (25 deg C.) it’s time to move to the next phase. The screen is removed and Shigeo opens up the tree with his chainsaw. Removing bees with Shigeo’s bee vacuum. Tree is completely free of bees. 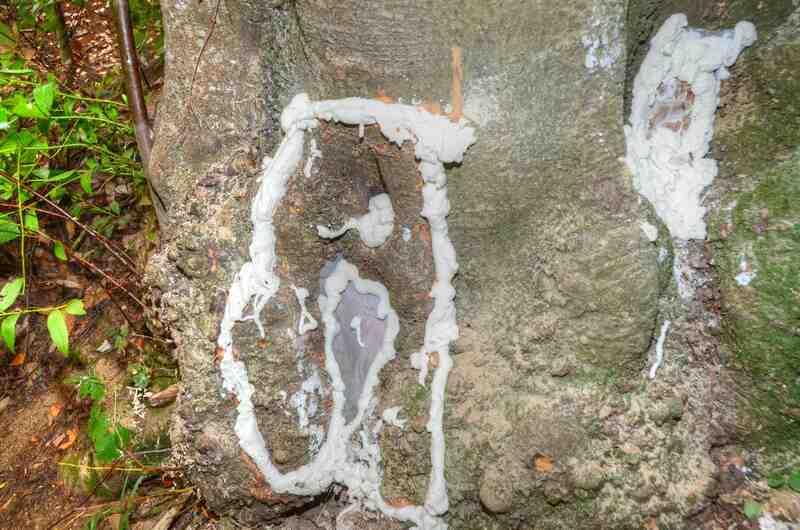 This tree is ‘insulated’ against the possibility of another batch of bees entering it. 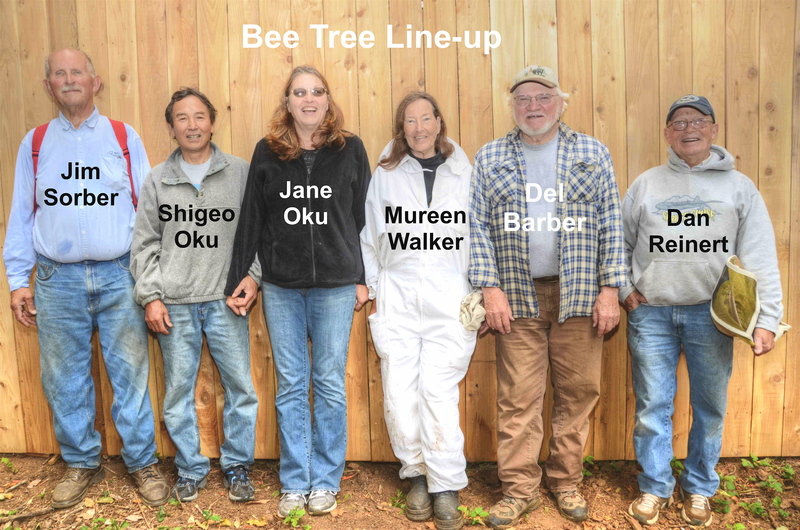 This has been a joint effort with many ‘players.’ On the left, Shigeo Oku, vice president of Coos County Beekeepers Association, brought his bee vacuum and expertise. 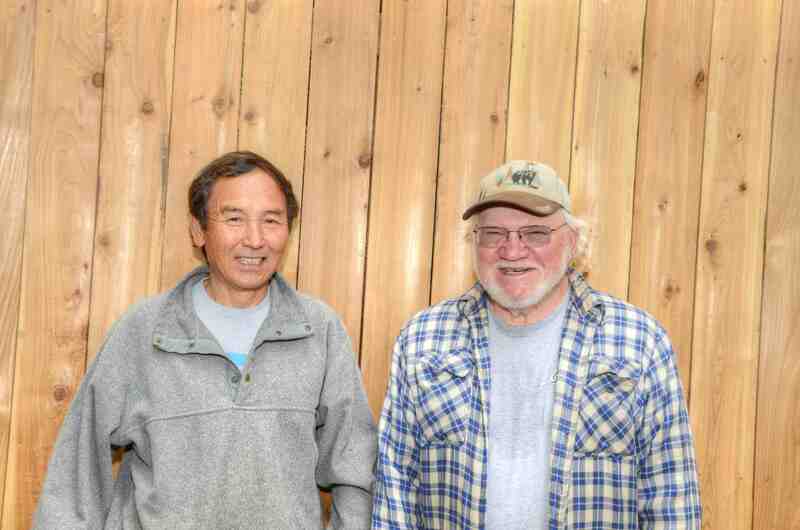 On the right, Del Barber, president of Oregon South Coast Beekeepers Association was project leader. Jim Sorber helped from the very beginning, monitoring temps and checking the screen. Shigeo and Jane brought all their equipment to help in the final stages. 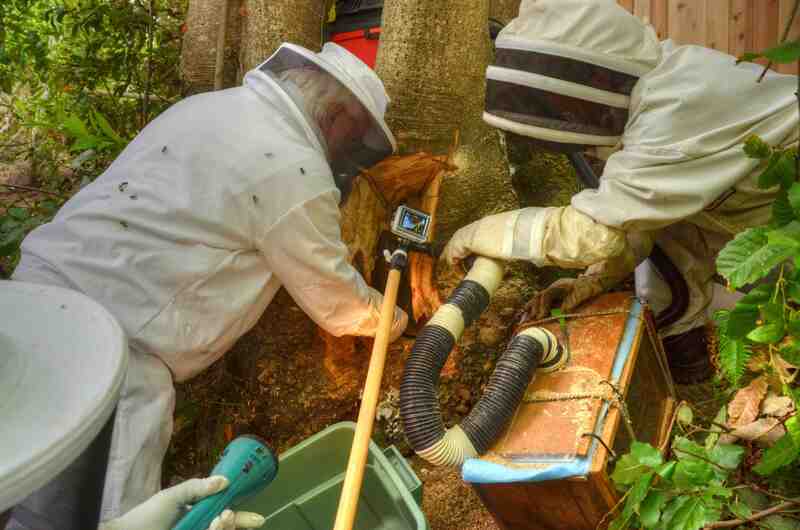 Mureen Walker shot the video and photos when the tree was opened up and last bees were removed. Del Barber was project leader, making everything happen. 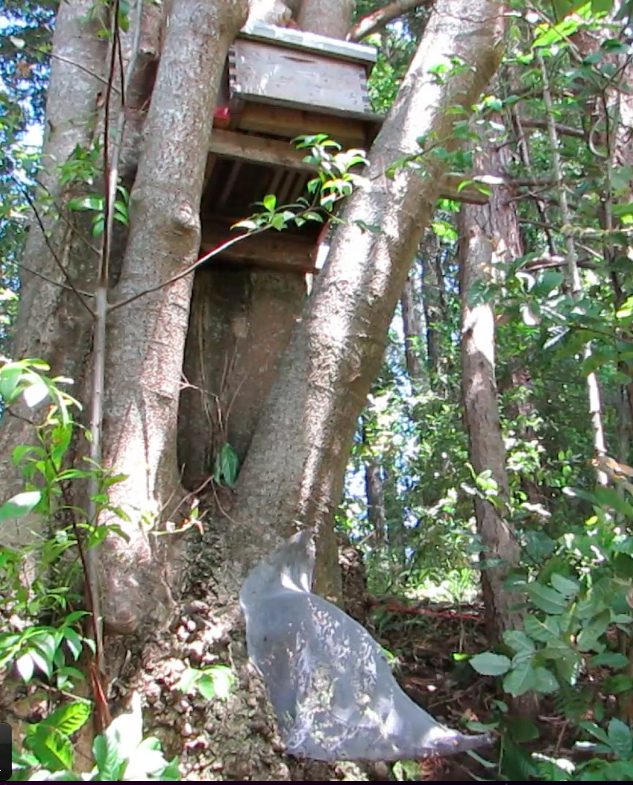 He built the trap-out, set up the hive box in the tree, and successfully moved bees from tree to a hive box. 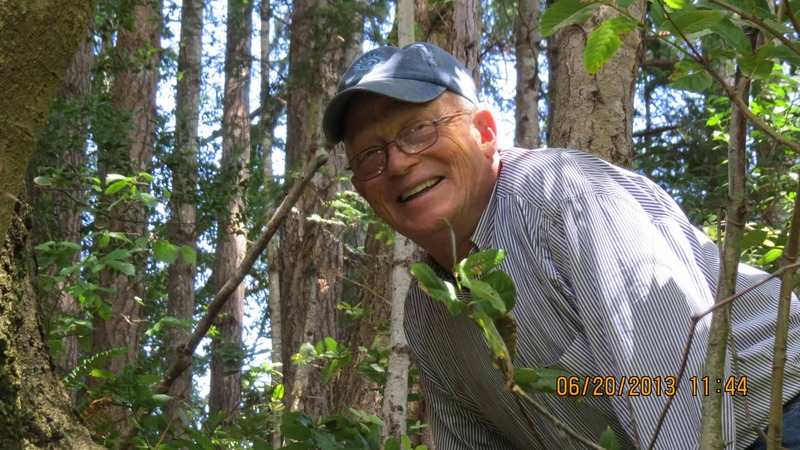 Dan Reinert owns the property where the bee tree was located. 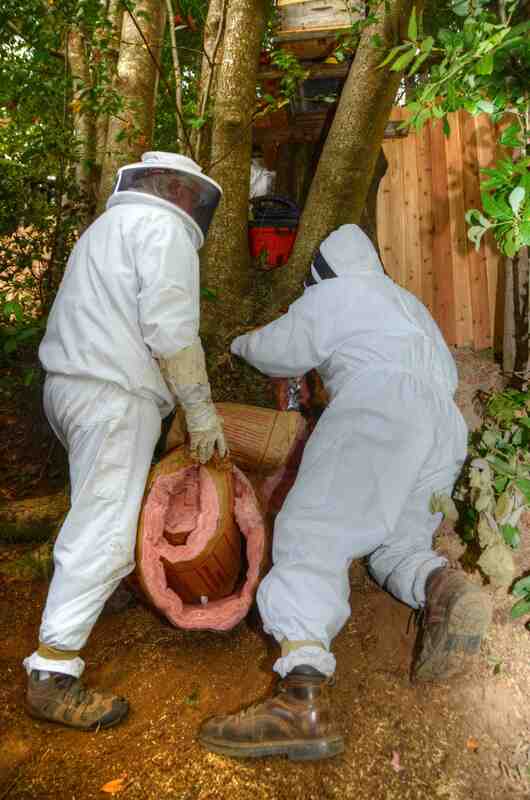 Thanks to everyone, both bees and tree were saved. 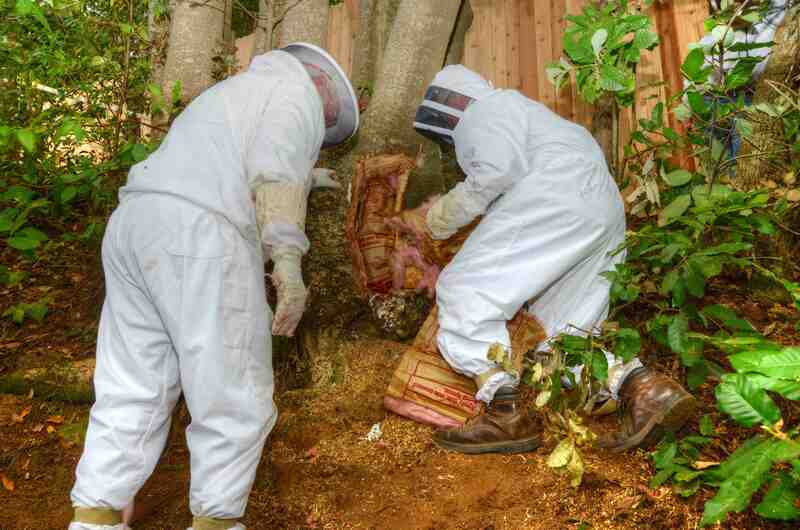 This video shows the steps taken to successfully move the bees out of the tree and into a box hive, and how to prevent future bees from relocating in the tree.